I started my pregnancy with April when she was still doing hospital births. When I went to my 37-week appointment April told me that she was no longer doing hospital births. I was devastated. I thought my only options were to go with the OB she practiced with or start looking for a completely new provider. I scheduled my next appointment with the OB and by the time the appointment was over I was even more upset. I had a feeling I was going to go past my due date and one of the first things he said was that he wouldn’t let me go past 41 weeks because he thought my baby was going to be big. When I got home I called my doula, Allison, to tell her how the appointment went. I told her how upset I was. She told me that April was starting to do home births and asked me if I was interested. I jumped on it without any hesitation because I really trusted April and I knew with her I would get the natural birth that I wanted. I was right about going past my due date. I went two weeks and one day over my due date and if I would have gone with the OB I would have been induced and I wouldn’t have gotten my ideal birth. I was 42 weeks pregnant and I had tried EVERYTHING to get labor started, nothing worked. On Friday I had acupuncture to start labor. It got some really good contractions going but they stopped after ten hours. On Saturday April came over to check on me. She did some cervical massage to get things going. Almost immediately after she left my house I started having contractions. It was around 3:00 pm. I labored at home with my husband, Ricky. We watched a movie and just tried to relax. I was so excited that I was having contractions but I was also really afraid that the contractions would stop because it had already happened twice. April and Allison kept calling and checking on me throughout the day. Around 10:00 pm Allison came over and set up the labor tub. At this point I was still handling the contractions really well and I was comfortable. I labored in the tub for awhile. April came over around 11:00pm. April came over around 11:00pm. The contractions were still very manageable. I was in the tub. We were just chatting between contractions. During a contraction either April or Allison made sure to comfort and encourage me. 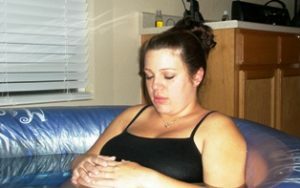 The contractions progressively got more intense and I continued to labor around the house. April made sure to keep me moving and changing positions. At some point in the early morning April had me get in bed and rest between contractions. Ricky and Allison took a break and rested. April stayed with me and encouraged me and made sure I was comfortable through each contraction. I look back and I don’t know how she managed to stay awake and coherent through the whole night but she did and she was wonderful. 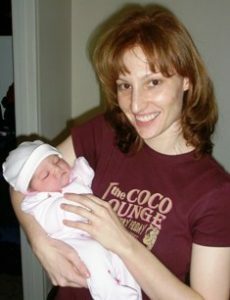 When my contractions started I had mistakenly assumed I would have Olivia in my arms by the next morning. When I realized the sun had come up and I still didn’t have my baby with me I got discouraged. Everyone just kept on encouraging me and telling me how strong I was. April checked me and found that I was almost fully dilated but there was still a lip of my cervix in the way. She tried holding it back while I pushed but it wasn’t working. We tried this a couple of times but I just wasn’t ready. I decided I needed some time alone to get myself together so I went in the bathroom and spent some time alone and talked to Olivia. I got in the shower and it really helped ease the contractions. I stayed in the shower for what seemed like forever. April and Allison would come in occasionally to encourage me and for April to check on Olivia’s heartbeat. In the shower something changed and I just decided that it was time for Olivia to come. When I got out of the shower the contractions were right on top of each other. I told April that I needed to push. She checked me and said I was ready. I pushed for awhile on my bed and I remember April saying I had pushed her half an inch and I almost started crying saying, “that’s all.” April assured me that that was a lot. April had me move to the toilet and push for a while. I moved back to my bed to push. April at one point asked me if I wanted to deliver Olivia in the tub. I really wanted a water birth but by that point I just wanted to hold my baby and I didn’t think I could make it to the living room to deliver in the tub. At 1:45 pm on Sunday, December 9th Olivia entered the world guided by her father’s hands. She weighed 9 pounds even and was 21 inches long. Ricky laid her on my belly. She was the most beautiful thing I had ever seen. It was the most amazing experience of my life. I look back and realize how blessed I was to have such wonderful experience and it was because I had such an amazing birth team.